An Escapologist’s Diary. Part 18. Somewhat lethargic this week after spending time with four fine and fruity friends visiting from Britain. Wherever they go, alliteration follows. It was brilliant to see my friends again and to have them close by, perhaps especially Dan, whom I enjoyed having as a Kramer-like neighbour for three weeks. I’ve just read that his return flight was turned around in midair when someone noticed smoke coming from the cockpit. Blimey. He’s safe and sound at home now, though perhaps with trousers slightly browner than what he’d left Montreal with. Kudos, Dan. I’d have panicked and released the emergency escape hatch in an instant. So yes, somewhat lethargic as I endure a general hangover in the absence of my pals. To make matters worse, I’ve also decided to give up coffee completely in accordance with the ‘Escape dependencies’ piece in New Escapologist Issue Three and the recent blog post suggesting others do the same. Needless to say, this has resulted in my feeling groggy and slow for a few days and my numskulls forming a trade union and going on strike. The most productive thing I’ve been able to do these past few days is to read chunks of Larkin on the chaise. Thankfully, I think I’ve finally arrived on the other side of this lethargy, so I’m ready to kick a few projects into shape including the New Escapologist ‘collected works’ book; the pending New Escapologist Issue Five; and, most imminently, our attendance at Expozine 2010. Expozine is a very well-attended local zine fair at which we hope to sell quite a few copies of our little publication and to generate commitment among a new Montreal readership. (Don’t worry, loyal British readers: we’ll run an event in Blighty during the first half of next year. Let us know if you have any specific ideas of what you’d like to see event-wise and we’ll see what we can do). Expozine should also be a good chance to make friends in the publishing world and zinesphere alike. Looking forward to it. Being Halloween and all, we recently made a superb jack-o-lantern (pictured) out of a 50lb pumpkin. 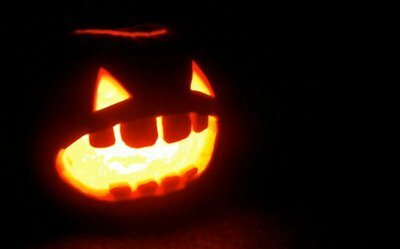 When I was a boy, it was difficult to get pumpkins and so my early jack-o-lanterns were inevitably carved from swedes and turnips. This would result in spooky little albino demons, arguably more scary than a pumpkin but lacking in the festive spirit we saw each year on American television shows. Even today in Britain, our pumpkins are not as impressive, cheap or readily available as they are in the New World. The monster of a squash we picked up this week made for a truly epic jack-o-lantern. Of course, it helped that I was accompanied by the two best people I can imagine for carving a pumpkin: Dan, a former butcher; and Samara, an artist. With her creative vision, his brutal bladesmanship and my sterling supervisory skills, we hollowed out the orange beast to great effect. Our 50lb pumpkin also made 50lbs (well, more like 30lbs, I suppose) of pumpkin soup. I had never made pumpkin soup before but it turned out to be very simple. Most recipes tell you to bake the fucker before souping it, but I couldn’t fit the guts of this great beast onto a baking tray no matter how I positioned it. I decided instead to purée the pumpkin raw and simply add it to the boiling water as one would do with any other vegetable. I also added a finely-diced half-onion, some seasoning and a little soya milk. The result was spectacular. Best pumpkin soup I’ve ever had, by golly. In a second batch, I experimented by adding some chunky vegetables and black beans. This was all wrong. I think I’m a pumpkin purist: make your pumpkin soup pure and creamy with no heartiness about it. With Dan here, it seemed appropriate to take in some of Montreal’s tourist sites that I had never seen before. To my mind, the most enjoyable day of exploration was the one on which we walked the length (and giddying height) of the Jacques Cartier Bridge. The bridge takes you off the main island of Montreal and onto the eerily quiet Île Sainte-Hélène islet (ultimately it takes you to the south shore of Quebec but we didn’t walk that far, so I lied when I said we walked the length. Please find it in your hearts to forgive me). The spookiness of the island was set up by the sight of a closed-down funfair. Nobody should see a funfair unpopulated. It was chilling to say the least. 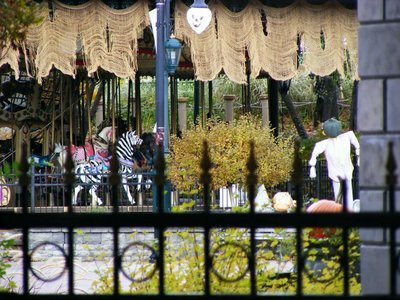 Not only was it unpopulated, the roller-coasters silent, but the place was adorned with Halloween decorations presumably for an upcoming event (or perhaps because the funfair was abandoned on a tragic Halloween night in the sixties and nobody has been there since – bwahaha etc). Check out the above photograph taken by my friend Olivia when she visited a few days after we did. Perfect setting for a Scooby Doo cartoon or a Stephen King novel. While on the bridge, Dan and I also spotted a fenced-off staff area from above, filled with damaged roller-coaster carts and dodgems. One can only imagine the stories those spooky artifacts could tell. We left the bridge and visited the weirdly empty Parc Jean-Drapeau and eventually to the proper tourist destination, the biosphere: one of Buckminster Fuller‘s geodesic spheres. Fuller’s vision was one of economy: of achieving the most worth with the minimum of human effort and environmental impact. It’s a brilliant thing and certainly worth seeing, but the lack of other humans about the complex, combined with our being in the shadow of this gigantic futuristic structure, gave the feeling of being in a post-apocalyptic future in which all the humans have been wiped out and only the pigeons remain. Again, this was a great setting for the week of Halloween. I will sign off now before this entry gets too long and reaches the present moment. Happy Halloween, everyone.